Are British Sovereign gold coins a wise investment choice if you are looking at bullion investment? There are many types to consider if you want to buy and sell gold bullion coins as a great investment opportunity. The specific products you choose will depend on a number of variables, including your personal preferences, the country you live in, the amount of investment capital that you have, and many others. Krugerrand gold coins from South Africa are very well known, and preferred by some investors for a variety of reasons, but others prefer gold coins from Britain, China, United States, Canada, Russia or other countries. 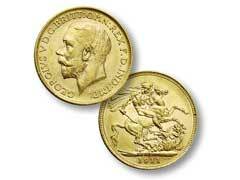 British Sovereign gold coins are the most well known and trusted coins in the entire world. The bullion variations of Sovereigns were first minted in 1816 opening a great opportunity for British investors to diversify their portfolio. To even further describe the Sovereigns’ superior liquidity many military officers carried these for basic survival needs in worst case scenario during WWII. American soldiers as recent as Desert Storm carried an emergency kit that included British Sovereign gold coins in case of an emergency evacuation. These coins are accepted in almost every country, and can be used as legal tender if need arises. American Eagle gold coins can also be a fantastic investment for some individuals, and so can gold Maple Leaf coins from Canada. Many investors prefer the British Sovereigns because they offer more benefits, and are more widely recognized and accepted globally. Many countries have started coming out with bullion strikes since the first British Sovereign gold coins appeared. China is one of the most recent examples, and they offer Panda bullions and proofs in various sizes, weights, and denominations. After evaluating all of the factors, a large number of investors still prefer the British numismatics most often. For citizens of United Kingdom, British Sovereign gold coins also offer additional tax benefits. These transactions are exempt from the value added tax and the capital gains tax, to encourage domestic precious metal investment over foreign gold coin investment choices. This has not prevented other investors from buying these coins, and they are popular with Americans as well. So here you have it, there are many reasons to consider these British bullion products due to superior liquidity, survival purposes, high investor and numismatic demand, and high world wide recognition. However, due to the coins’ obvious benefits, the dealer premium costs are just too high and have a high potential to take the reason out of precious metals investment altogether. Consider acquiring some of them to diversify your portfolio and search for lower premium bullion to maximize your precious metal investment potential.